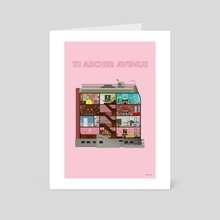 Royal Tenenbaum bought the house on Archer Avenue in the winter of his 35th year. This print is an extensive and detailed recreation of the house from Wes Anderson's The Royal Tenenbaums in the form of Pixel Art, inspired by retro video games. From Chas' dalmatian mice to Richie's paintings of Margot to Mordecai's rooftop shack, if you saw it in the film, odds are you're going to see it in this poster. 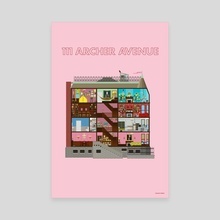 -Although "Archer Avenue" is fictional, the "Tenenbaum house" did exist as a practical location at 144th street and Convent Avenue in the Hamilton Heights section of Harlem, in Manhattan. For the film shoot, the production designers rented and completely redecorated the house. The scenes in the kitchen, however, were actually shot in another real house, next door. -The spots on the dalmatian mice were created using a Sharpie pen. -The movie is set in a fictionalized version of Manhattan, with such imaginary addresses as "100 N. 30th Avenue" (the address of the hotel where Royal stays) or the "375th Street Y," itself inspired by NYC-area facilities operated by the Young Men's Hebrew Association.